We provide this safe and minimally invasive procedure in order to internally examine, evaluate, and biopsy the gastrointestinal and upper airway structures. Endoscopy uses a flexible, fiber optic tube introduced through the mouth in an anesthetized patient. Due to the size of our endoscope, we are only able to provide this service for our canine patients. Our trained doctors also may use this tool to remove certain types of swallowed foreign material from the stomach, potentially sparing your dog more invasive traditional exploratory surgery. Our doctors can perform endoscopy on many types of cases, though they may choose to refer to board-certified veterinary internists if it is more appropriate for your pet. 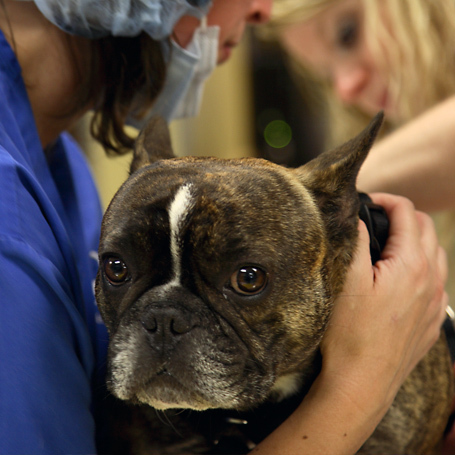 If your pet needs endoscopy, we can help. Call us to discuss your pet’s needs in this area.